Home > Browse > Friend for life! 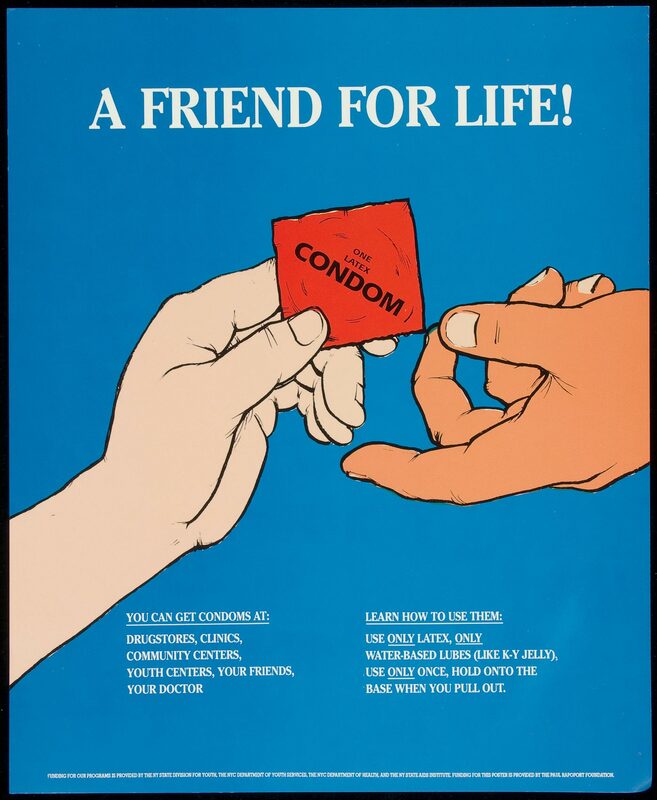 "You can get condoms at: Drugstores, community centers, youth centers, your friends, your doctor." "Learn how to use them: Use only latex, only water-based lubes (like K-Y Jelly), use only once, hold onto the base when you pull out." "Funding for our programs is provided by the NY State Division for Youth, the NYC Department of Youth Sercices, the NYC Department of Health, and the NY State AIDS Institute. Funding for this poster is provided by the Paul Rapoport Foundation." Illustration of a hand passing an orange condom package to another hand against a bright blue background. Text describes where condoms are available and how to use them.